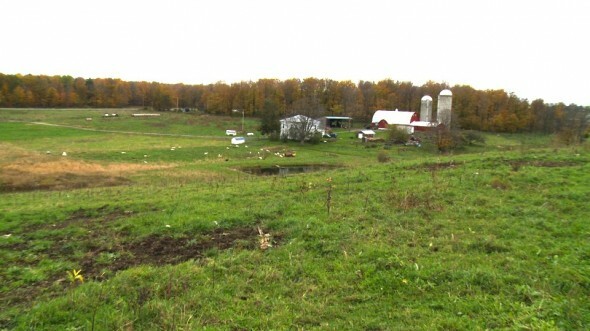 ﻿On Saturday, October 22nd, we visited Eric Shelley’s farm in Cobleskill, New York. Eric is the director of the Meat Processing Program at SUNY Cobleskill, and invited us to tour his 138-acre farm, meet his family, and learn how he raises his animals humanely on pasture. We also arranged to watch an on-farm slaughter of a lamb later in the afternoon.The farm is absolutely gorgeous and expansive. This is a view from the cattle pasture up on a hill. What made our farm visit even more of a memorable experience was that we were accompanied by his sons, Beau (4 years old) and Duke (1 1/2 years old). Eric is truly an amazing father! 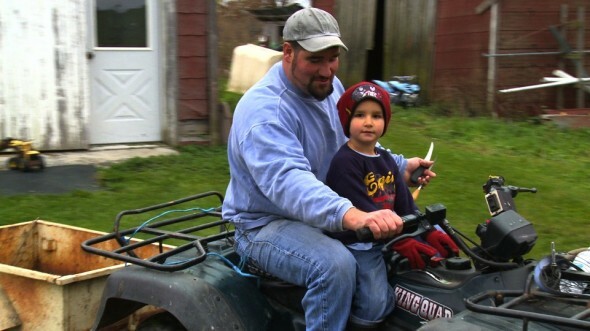 They are fortunate to learn so much about farming at a young age. Watching how these children interacted with the animals was quite endearing. They are not afraid and even the guard dog, Turk, is affectionate. Eric explained, though, that if a stranger approached him, he wouldn’t be that affectionate! Look how big he is! 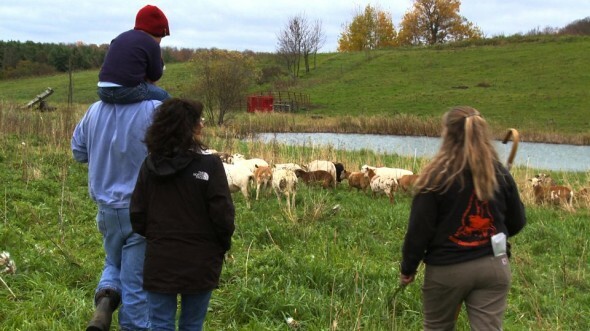 Eric’s sister, Dr. Cindi Shelley, raises dairy goats on the farm, and also teaches Animal Science at SUNY Cobleskill. Eric and Cindi explained all about the goat herd. 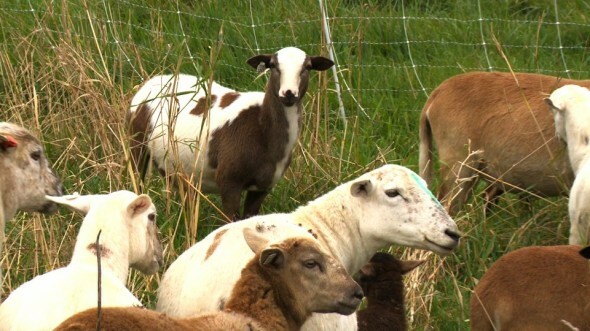 Each goat is truly fascinating with her own personality! Speaking of personality, this girl took a liking to my sweater sleeve and wouldn’t give it back. She eventually moved on to something more tasty. And speaking of tasty, I guess a wireless microphone cord must be fairly yummy. We wondered why my audio was going out, and it was because “someone” nibbled it from my back pocket! Here I am inspecting the damages. As a professor of Animal Science, Cindi can explain anatomy very well. They found this cow skull on the land when they bought the farm, and now they use it to educate people about how a cow tears and chews grass. Beau and I found the structure of the teeth quite interesting. After meeting all of the goats and learning about cow chewing, we were invited inside for a brunch with homemade pancakes – made by Beau and Eric, of course! Eric is such a patient teacher, not only with his students at the Meat Lab, but with his son over a hot stove. After brunch it was time to see the rest of the farm. The cattle (a cow-calf herd) graze in a lush pasture on a hill overlooking the farmhouse and barn. 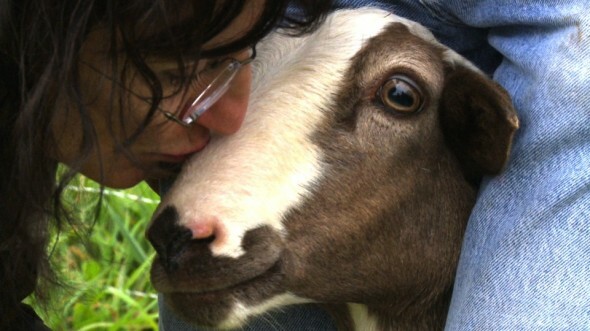 These animals are so healthy and we could tell how much attention they get on a daily basis from Eric. These animals are so very big, yet so very gentle. Eric did not worry about Beau getting close to them. At first, I was the apprehensive one, but learned that if you approach them the right way, they can be very affectionate. Eric told us about the “flight zone” and the best way to touch them without scaring them. Cindi is also very good with the cows. She told us how a cow-calf herd operates, and also explained the economic side in regard to how much farmers can get a pound for the beef. I could tell that the cows really like Cindi, and they especially liked the fact that she had a grain bucket behind her back! Watching this calf nonchalantly nurse right in the middle of the pasture was a remarkable sight! It’s so heartening to see animals raised this way! After we finished seeing the cattle, it was time to enter the more poignant part of the day – the harvest of a lamb on the farm. In order for someone to legally obtain meat from an on-farm slaughter (since it’s not state or federally inspected), the animal must be purchased by the customer while it is alive. The meat will then be butchered and given to the customer in packages marked “Not For Sale.” Since I’ve never seen an on-farm slaughter or even eaten the meat from an animal I’ve seen harvested, I decided to purchase a lamb for Eric to to harvest in my presence, and for us to film the process. Cindi raises these “hair sheep” (Katahdin), that grow hair rather than wool. We walked to the lamb herd where I was about to choose my lamb. When we arrived at the pasture where the lambs were, it was then time for me to choose a lamb for harvesting. I realize that I go back and forth with the terms harvesting and slaughtering. 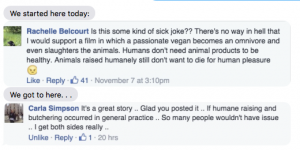 While slaughtering may be more accurate about what actually happens to the animal, harvesting implies that the animal is not only being killed, but will become food. I guess harvesting is more inclusive of the cycle of life and death. That being said, it was still difficult to be the one to determine which lamb was to die. 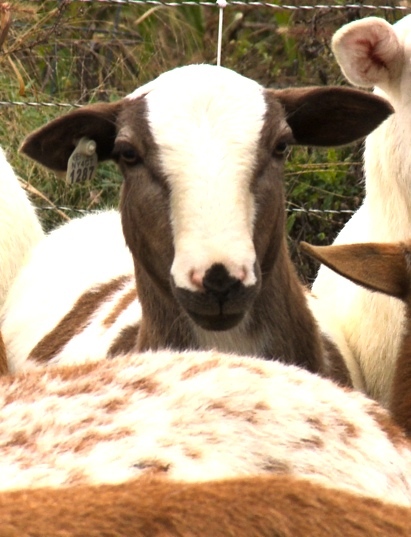 I spotted a very special brown and white lamb that kept looking at me, and decided that he was to be the one. I also wanted to give him a name. I strongly believe that just because we are going to eat an animal, it doesn’t exclude the need for treating that animal respectfully as a sentient individual. I decided to name him Shiva. This is partly because my name is “Kali” and in Hindu mythology, “Shiva” is “Kali’s” counterpart. The other part of my decision to name him Shiva is because it also means mourning in Judaism. Choosing him was surely wrought with an amalgam of feelings for me. This is Shiva looking at me. 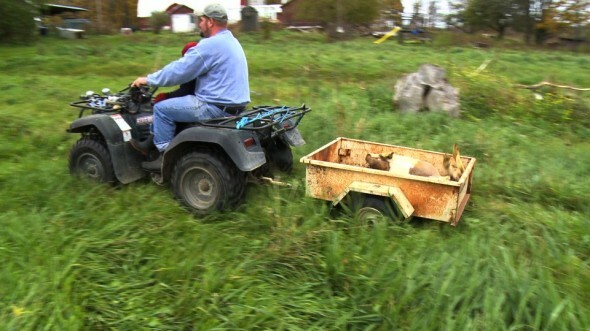 After I had chosen Shiva, Eric (with knife in hand) and Beau set out in the four-wheeler to where the lambs were and brought along a trailer to haul the harvested Shiva back up to the house. Cindi also had to “catch” Shiva. This took quite a bit of skill, and it was important to do everything very quickly so that he wouldn’t be stressed and afraid. I was very impressed with how skillfully Cindi pulled Shiva from the rest of the flock. After Cindi caught Shiva and herded the other lambs into another section of the pasture, Eric immediately put Shiva between his legs into a comfort and calming hold. Eric also put his fingers under Shiva’s chin, which he explained is another calming pressure-point. Shiva seemed to feel very safe and assured in this position. It was also important for me to visit with Shiva for a few moments before he left this world to become meat. I undertand that a lot of people don’t want to be face-to-face with an animal that will become their food, but I think that we owe it to them to look them in the eye and accept that we are responsible for their death. It may make us feel uncomfortable, but it is more honest than pretending that an animal didn’t die to become our food. Eric then moved Shiva to a different holding position that makes lambs feel comfortable. Eric let me feel Shiva’s heart rate to see how relaxed he was. I then told Shiva that I love him, gave him a kiss, and then said goodbye. While this was very sad, I trusted that Eric would give him a swift and painless death. Eric had decided that it was time for Beau to also witness an on-farm harvest for the first time. Beau held his Aunt Cindi’s hand, watched intently, and then listened carefully as his Daddy explained everything that just happened. I have tremendous respect for Eric and how he gently took the time to tell his son about this part of this cycle of life. I then took a moment to kneel down next to Shiva’s body and thank him for the life I had taken from him. I can honestly say that I will never again take a bite of meat without acknowledging that a living being had given his or her life for that meal. 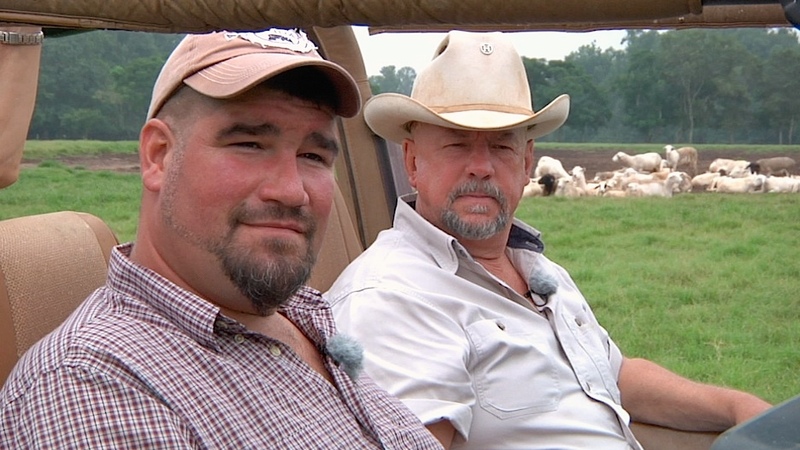 Eric and Beau then got back into the four-wheeler and took Shiva’s body up to the backyard of the house where he would hang Shiva up, take off his hide, and eviscerate him. Shiva had gone from being a 7 month-old lamb frolicking in the pasture, to an animal that was dead, to a body drained of its blood, to a carcass that would be butchered into meat. Eric explained all of the different cuts of meat that come from various parts of the carcass, and I looked on trying to wrap my mind around all of my feelings. It’s too bad that in a culture that eats so much meat, most of us are never taught as children how this happens. I had to wait until I was in my fifties! Beau has the gift of being let in on this societal secret and will be a better human being for it. I saved the [#1287] tag from his ear (which is now on my dresser in my bedroom). 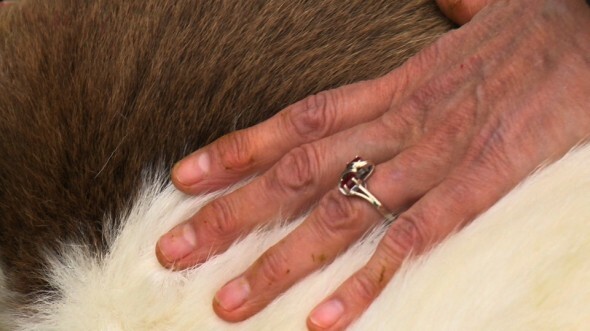 And I took his hide home so I could have it treated and keep it for remembrance. In a couple of weeks I’ll return to the farm to pick up the packaged cuts of lamb meat. But I suppose I prefer to remember Shiva as he was when he was alive. I also will acknowledge that it was me who decided he would be in plastic wrap by the end of the day. It’s this kind of somber honesty I choose to embrace.